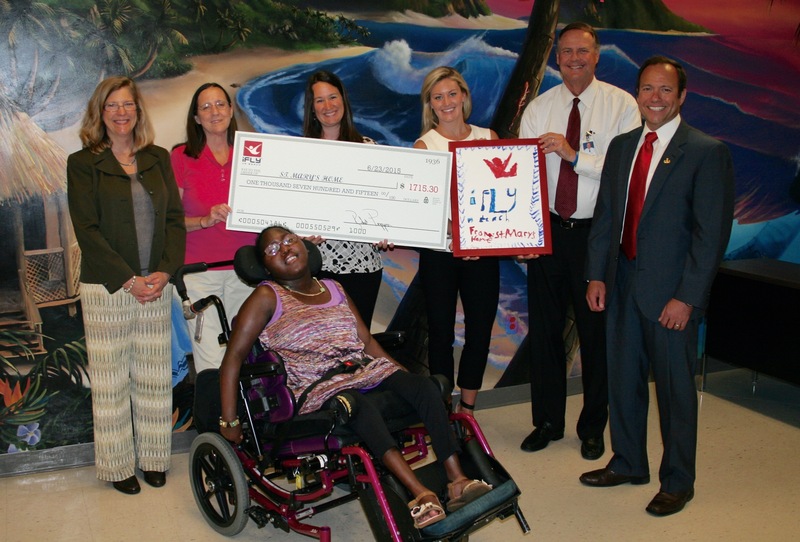 Representatives of iFLY Va Beach visited St. Mary’s Home in Norfolk on June 23 to present a donation to Koko and friends that represented part of the nearly $2,200 raised during the “Soar with St. Mary’s” event May 30 at iFLY. Koko, 20, a resident of St. Mary’s who flew during the event, presented iFLY with a piece of artwork painted by Jorge, another resident who also flew. With Koko are, from left: Mary Helen Hilton, St. Mary’s director of annual giving; Rhonda Bailey, PTA, St. Mary’s director of physical therapy; Shannon Edsall, St. Mary’s development associate; Renée Ainslie-Rodriguez, iFLY Va Beach marketing & public relations manager; William C. Giermak, St. Mary’s CEO; and Bob Pizzini, iFLY Va Beach CEO. 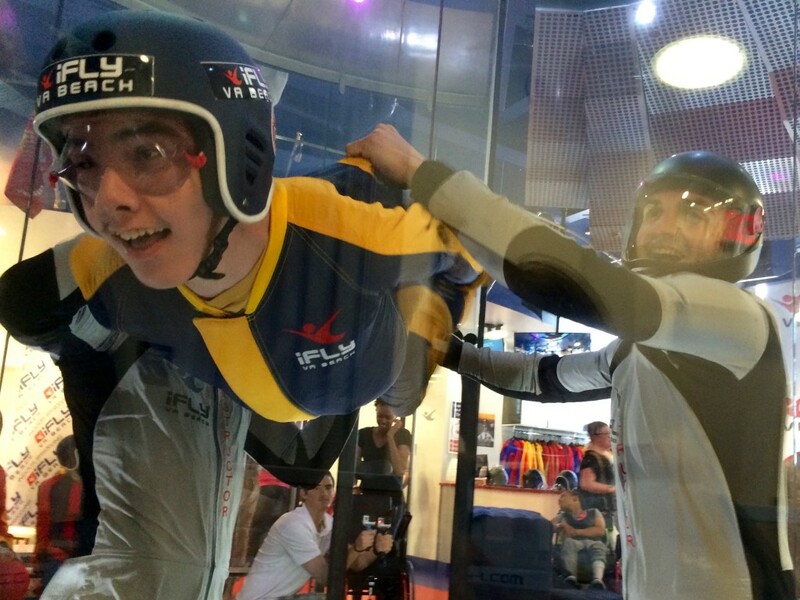 NORFOLK, Va. (June 29, 2015) — Half a dozen children and young adults with disabilities conquered the impossible and got out of their wheelchairs to fly during a special event at iFLY Va Beach’s indoor skydiving facility that raised nearly $2,200 to support more fun activities like this for residents of St. Mary’s Home. Representatives of iFLY Va Beach recently visited St. Mary’s in Norfolk to present a donation to Koko, who flew during the May 30 “Soar with St. Mary’s” event, and friends. Then Koko presented iFLY with a piece of artwork painted by another resident, Jorge, who also had fun flying in iFLY’s vertical wind tunnel at the Virginia Beach Oceanfront. “Out of all the special events iFLY Va Beach has done since opening in January, this has easily been the most rewarding — not just for myself, but for our staff,” said iFLY Va Beach CEO Bob Pizzini. St. Mary’s Home worked with iFLY Va Beach to set aside time during the event for six children and young adults to fly, along with family, friends and staff of the Home. iFLY’s donation of more than $1,700 represented revenue raised in addition to the registration fees paid to St. Mary’s. “Soar with St. Mary’s” was the first in a series of three fundraising events this year for St. Mary’s. For more information, visit saintmaryshome.org/news/events. About iFLY Va Beach: iFLY Va Beach is an indoor skydiving experience that creates free-fall conditions, just like skydiving, without having to jump out of an airplane. iFLY Va Beach features a vertical wind tunnel that generates 1,400 horse power from four powerful fans, creating a wall-to-wall cushion of air. John, 17, who lives at St. Mary’s Home, flies in the indoor wind tunnel at iFLY Va Beach during the “Soar with St. Mary’s” special event on May 30.